During the 24th Climate Summit in Katowice, there was a MLE debate devoted to intergenerational solidarity in energy and climate policy. The debate was moderated by Michał Hetmański from Fundacja Instrat. During the event, MLE and the Instrat Foundation presented their report on intergenerational solidarity in energy policy. Young Leaders in Energy and Instrat Foundation have published their report on intergenerational solidarity in energy & climate policy in Poland. Its details will be presented at COP 24 in Katowice. Katarzyna Szwarc, Member of the MLE Board joined the Advisory Council of the Academy of Energy organized by the Fundacja im. Lesława Pagi. The Academy is an educational project aimed at young people in the energy industry. In 2019, the 7th edition of the program will be launched. We look forward to working with the Paga Foundation for the benefit of the Academy and its participants. There's over 100 of us! On November 10, the MLE Management Board adopted a resolution on the admission of new members to the Association. There are already over a hundred of us! At the same time, over two hundred associates are in constant touch with MLE and participate in our events! MLE debate "Everything you wanted to know about energy prices but were afaid to ask"
On 9 October, in the House of the Jabłkowscy Brothers in Warsaw, MLE organised an expert debate on energy prices and the reasons for their dynamic increase in recent months. The meeting was held under the patronage of the Energy Regulatory Office (URE), the Energy Trading Society (TOE) and the Polish Power Exchange as well as Dziennik Rzeczpospolita, Biznes Alert and WysokieNapięcie.pl. The meeting was also attended by over 120 members and supporters of our Association. Thus, it was one of the biggest events organized so far by MLE! For the first time, Twitter users could also follow our event at @LiderzyEnergii. Continuation of the discussion will be workshops with experts in the field of energy policy and market structure organized by us in cooperation with the Polish TSO, Polskie Sieci Energetyczne SA. More information on that soon! MLE expert, Joanna Rycerz took part in the debate on the future of the Polish and regional gas market during the New Industry Expo 2018 conference, which took place on September 26-28, 2018 in Katowice. The discussion was moderated by Jacek Ziarno, editor-in-chief of the New Industry magazine. Joanna Rycerz, our expert and Member of the Management Committee, took part in the debate on the future of the European gas market during the 10th European Economic Congress which took place on May 14-16, 2018. Grzegorz Żarski, Director of Market Development at the Polish Power Exchange. The discussion was moderated by Arkadiusz Krasnodębski, Managing Partner at Dentons. On April 11, 2018, MLE members participated in workshops with experts from the Polish Power Exchange. During the meeting, the participants raised issues related to trading environmental, the role of the exchange in the creation of a regional gas hub as well as changes in the functioning of the energy market resulting from the EU Directive MIFID II. These workshops were the first of a series of meetings organized by MLE regarding specific issues of the energy market in Poland. Information about next one coming soon! We are proud to inform that Darek Kryczka, one of the leading young professionals in the energy industry in Poland has been elected to the Management Committee. Darek is a lawyer and political scientist. He graduated from the University of Silesia in Katowice, Warsaw School of Economics and Università degli Studi di Firenze in Florence. He is an alumnus of various programs for young leaders, including the Paga Energy Academy, Paga Capital Market Leaders Academy or the Academy of Young Diplomats. Professionally, Darek works in the oil & gas sector where he is responsible for LNG projects, external relations and regulatory aspects. He is a member of the Global Shapers Community, the World Economic Forum’s.international programme. In 2013, he was invited to participate in the World Economic Summit in Davos as one of the 50 representatives of the young generation of world leaders. In January this year, Piotr Konopka resigned from the Committee. Welcome to the new Members of MLE! On December 13, 2017 the Management Committee of the Association adopted a resolution on admission to MLE of over 40 new members. This is an important step in the development of our organization and building a strong, open group of young professionals in the energy sector in Poland. On 23 November, MLE organised a debate dedicated to the situation and perspectives for start-ups in the energy sector. Participants in the debate were Anna Trojanowska, Head of Innovation at PGNiG, Michał Kłos from the National Center for Nuclear Research, Grzegorz Nowaczewski, CEO of Virtual Power Plant and Roberto Ventura, CEO of Rotoby. The debate was moderated by Bartek Kwiatkowski, Director of R&D at PSE Innovation. Special guest of the event was Thore Hildebrandt, Community Manager at Grid Singularity, a start-up using blockchain in energy industry and at the Energy Web Foundation. In the recent issue of Electroenergy you'll find our article on the regulation of energy storage market. You can find the article here (in Polish with the abstract in English). Energy storage - the missing link in the system? 'Energy storage facilities are worth developing, despite the fact that the early stages of the market regulation may be a hindrance to their full potential' - agreed the participants of the debate 'Energy magazines - barriers and opportunities for development and integration into the power system' . The debate took place on 23 October at the Center for Innovation Management and Transfer of Technology of the Warsaw University of Technology. The debate was attended by Mariusz Kłos, Phd. from the Warsaw University of Technology, Maciej Kwiatkowski, Director at Impact Clean Power Technology, producer of lithium-ion batteries and Katarzyna Szwarc, MLE expert and ambassador of Power Ledger. The discussion was moderated Bartłomiej Derski from WysokieNapiecie.pl. Rzeczpospolita, Parkiet and WysokieNapiecie.pl were partners of the event. Join the MLE Working Group! One of the goals of MLE is to involve young professionals in the public debate on the future of the Polish energy sector. That is why we invite all our members and sympathizers to participate in the work of the MLE Working Group! Within the Group, we will discuss the most important trends in the development of the Polish energy industry, create evidence-based reports and recommendations and consultations with experts, and share knowledge and experience. On 22 June 2017, the inauguration of the MLE took place, accompanied by the debate on opportunities for development of young people in the Polish energy sector. The speakers included Michał Kurtyka, Undersecretary of State in the Ministry of Energy in Poland, Maciej Bando, President of the Energy Regulatory Office, Lidia Grzegorczyk, CEO of Smart Fuse and Joanna Maćkowiak-Pandera, President of the Energy Forum as well as Tomasz Sikorski, Vice President of PSE as moderator. The debate focused on the situation and prospects for development of young people in the Polish energy sector and was combined with a presentation of results of a survey conducted by MLE among young professionals. Eryk Kłossowski, President of PSE, gave the inaugural speech. The debate participants agreed that technological and scientific progress has brought new solutions and opportunities, but also completely unknown challenges to the energy sector in Poland. Young people, who will soon lead the Polish energy industry through the transition period, should be brave in pitching their ideas and solutions, but also conscientious in learning about this demanding sector from experienced experts. The results of the survey conducted by MLE in the Q2 2017 clearly indicate a high level of involvement of young people in the development of the Polish energy sector and its community. ¾ gets involved within the energy sector community, either on behalf of employer or on their own; and ⅔ declares engagement in energy related initiatives also after working hours. As much as 76% chose working in the energy sector because they are interested in energy and 46% because they believe that this sector will grow dynamically in the coming years. Although statistics show that wages in the power sector are higher than in most other sectors of the economy, only 17% of respondents were financially driven in their choice of job and 12% of their work-life balance. As many as 94% of respondents associate their future with energy industry and 90% would recommend working in this sector to their friends. Young people positively assess their level of involvement in developing the energy sector in Poland; As many as 74% rated this level as high or very high. However, only 49% rates highly the impact of young people on development of energy industry in Poland, while 51% think that young people have little or no influence. Young people see the existing generation gap in the Polish power industry. ⅓ respondents correctly estimated the average age over 50 years. The vast majority indicated that the average was over 40 years. At the same time, respondents point to the barriers that make it difficult for young people to develop in the Polish energy sector - in their opinion there are no initiatives aimed at raising the level of knowledge of young people on energy issues (50%), no interest from employers in developing skills of young people within their organizations (46%), unfavorable organizational culture (41%) and the unwillingness of experts to share knowledge in fear of competition (15%). It is worth noting that nearly ⅓ of the respondents pointed out lack of contacts and knowledge as a barrier to career development in the energy industry. Half of the respondents believe that young people in the energy industry lack opportunities to develop at work. 47% indicated no access to authorities outside of work and 45% pointed tono networking opportunities in the energy sector. Only 14% thought that young people lacked inspiration or simply did not want to develop their careers. Young professionals point to the need to tackle the problems of power shortages (71%) and Polish mining (69%) as well as the integration of the Polish energy market with the EU Internal Energy Market (42%) as well as RES integration (41%). The need for diversification of gas supplies and the construction of the regional gas hubs were indicated by only 19% and 15% of respondents respectively. Respondents also pointed to the aging coal blocks and transmission networks. Respondents also agreed on the key steps required to ensure the long-term sustainable development of the Polish power industry. 83% indicated the need to formulate a long-term strategy for energy sector. 44% considered the construction of new transmission networks most important and 42% indicated the launch of capacity market. Only 14% considered full liberalization of electricity and gas markets the most important step. Respondents also pointed out the development of RES for the consumers and the construction of energy storage. WHO ARE YOUNG LEADERS IN ENERGY? 78 people aged 29 on average responded to MLE’s survey (the youngest participant was 21 and the oldest 44). 57% of respondents work in the manufacturing sector, energy companies or transmission infrastructure operators. A smaller group is employed in public administration (14%), legal and advisory firms (9%), non-governmental organizations (5%) as well as energy trading, media and RES sector. As much as 96% declared higher education, primarily technical. We have responded to public consultation on the Minister for Energy's Programme for Cooperation with Non-Governmental Organizations in 2017-2018. MLE welcomes the opportunity to respond to the Minister for Energy's public consultation. We believe that MLE's participation in the Programme, as an organization representing young professionals working in the Polish energy sector, would consitute an interesting and important element of the initiative. Find our full response here. We welcome Polskie Sieci Elektroenergetyczne SA (PSE) as our Strategic Partner. Thanks to this cooperation MLE is supported by outstanding electricity sector specialists ready to share their expertise with young professionals and help provide an expert level of debate for our events. Cooperation with PSE is a special honour for MLE and an important element of our activity. We look forward to working together with PSE in achieving MLE's objectives. More information about our joint activities to follow soon! Joanna Rycerz, Member of MLE's Management Committee, spoke about Electromobility, Smart City and Smart Living at the The Strategy for Poland conference organised by the Law4Growth on 12 December 2016. 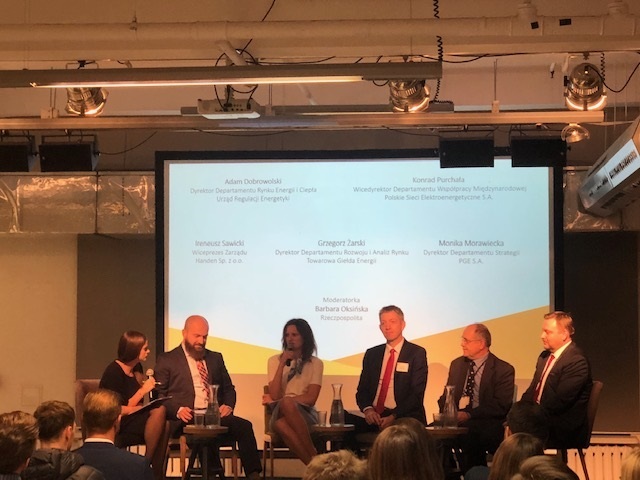 Katarzyna Szwarc, Member of MLE's Management Committee, spoke at the YPN.inspire conference organised by the Energy Institute Young Professionals Network on 15 October 2016 in London. The conference gathered over 100 representatives of the energy sector from all over the world and was an excellent occassion to exchange knowledge and expertise. Throughout the day, the speakers passionately spoke about their every-day work inspirations. Watch MLE's presentation about the European Energy Union!